Community volunteers restored nearly an acre of streamside habitat by planting more than 50 trees and 50 shrubs along 400 feet of the Jordan Creek in the Trexler Nature Preserve. 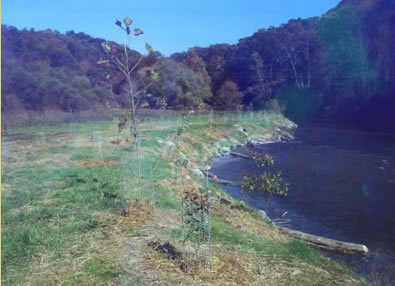 The trees and shrubs will aid in streambank stabilization to improve water quality and wildlife habitat. Wildlands Conservancy's mission is to preserve, protect, restore and enhance the land, water, ecological, and recreational resources of the Lehigh Valley and Lehigh River valley. Founded in 1973, the Conservancy has protected more than 48,000 acres of eastern Pennsylvania's farmland and wild lands, created more than 90 miles of terrestrial aquatic trails, and has educated more than 500,000 individuals on responsible environmental stewardship and management. The organization's main area of focus is the Lehigh River watershed and works to protect the water quality and aquatic habitat of the Lehigh River and its tributaries. The Lehigh River is more than 100 miles long and is fed by nearly 2,000 miles of tributary streams. Unfortunately the Lehigh River and many of its tributaries, which supply drinking water to hundreds of thousands of people, are so degraded by pollution that they are listed on the Department of Environmental Protection's List of Impaired Waters. To restore and protect Lehigh's streams, Wildlands Conservancy builds abandoned mine drainage treatment systems, removes dams, plants riparian buffers, builds aquatic habitat structure and restores floodplains. The organization also continuously strives to educate the community about the connection between human activities and clean water. The Wildlands Conservancy has worked with the Lehigh Earth Observatory (LEO) for planning grants and research.